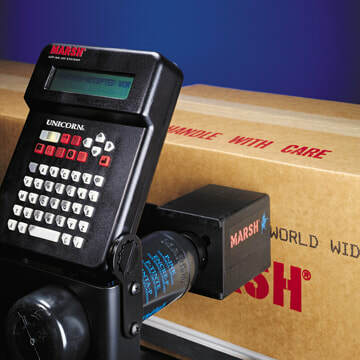 The MARSH Unicorn product family is a small complete solution for single and double line case coding. It is designed for a client who values quick set-up without technical complication . One box contains everything you need to start the printing process today. The menu driven operating system, quickness and direction, sensing photo eyes, and self-contained ink bottles make installing, learning, and using the Unicorn the simplest of any coding system available in this price bracket.